When you’re trying to eat healthily (or get your family to), unexpected hunger pangs and snack-attacks can be a real challenge. With the supermarket shelves packed with processed food and sugar saturated treats it’s all too easy to grab a packet or crisps or a chocolate covered cereal bar. 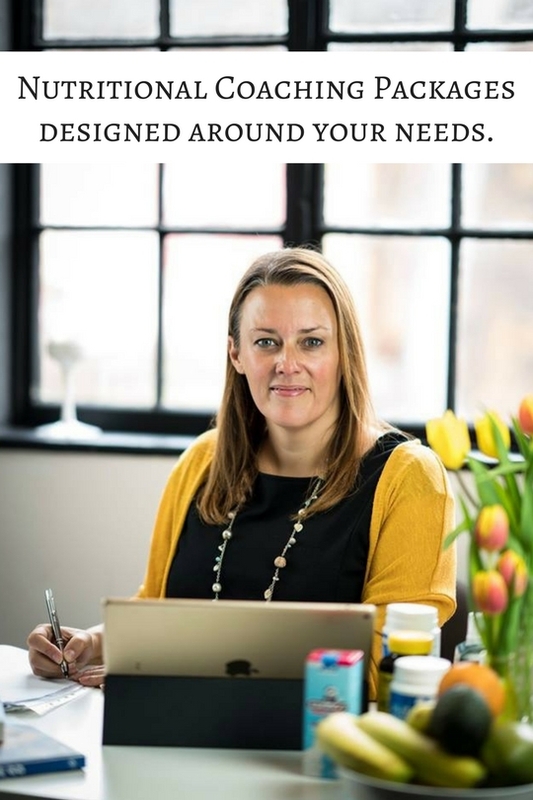 As a mum of two this is something I experience every day, sometimes, it’s me. I’ll get caught on a phone call or in a long meeting and come out feeling really hungry. And of course, as a mum of two I experience the daily post-school snack request! If you’re caught short then I suggest a small pot of natural yoghurt, or some chopped carrot or cucumber sticks with hummus. And of course, if you or your children haven’t already had 1-2 pieces of fresh fruit that day, grab an apple, banana, pear or whatever fresh fruit you have to hand. 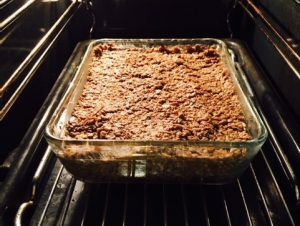 With a bit of advance planning, I usually have a few healthy snacks stashed away, and the best part is that these great tasting treats don’t come across as ‘healthy food’ – particularly the flapjacks! The kids are thrilled that they being allowed a proper ‘treat’ and I’m happy in the knowledge that I know they’re secretly eating healthy food! Put a handful of mixed seeds into a dry pan over a medium heat. 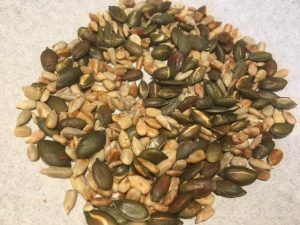 Sunflower seeds and pumpkin seeds work well, you could also add in some amaranth for crunch or some pine nuts. When they start to pop and jump a bit, add half to 1 teaspoon of tamari/soya sauce and stir well for about 1 minute. Serve on salad or as a tasty snack. You can also make a sweet version by using cinnamon, vanilla extract and a teaspoon of maple syrup. These will keep for a few days. For a nut free version, just add a little extra butter or coconut oil, instead of the peanut butter, and stick to seeds with the dry mixture. Put the chopped dates in a pan with about 100ml of boiling water and the butter or coconut oil. Bring to boil, take off heat and stir in the peanut butter. Let it cool, then blend. You can also add a tablespoon of blackstrap molasses or a couple of tablespoons of maple syrup if you like it a bit sweeter (melt in at start). In a bowl mix the oats (or a half oats, half quinoa flakes mix) apple (grated) or mashed banana, salt, coconut, raisins and sunflower seeds. Bake at 180c for about 30 mins. They are nice left a bit gooey in the middle! 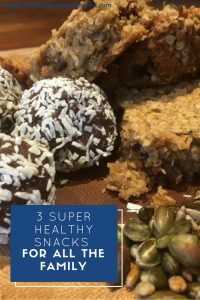 It’s nice to have a fudgey chocolate treat every once in a while, and these protein balls are great for keeping the cravings at bay or to snack on after exercise. Make golf ball size ones for a snack, or marble sized ones for a little treat in the evening. These are perfect size for kids too. A note on Protein powders: it’s fine to use a very small amount of protein powder for older children – but I wouldn’t use protein powders for any child under 5 years old, and use very small amounts for children up to 12 years old. There’s just a tablespoon in this recipe – which means that marble sized balls will give you only a small amount. Pick a protein powder that is as natural as possible – whether that’s whey, hemp or pea, and make sure it’s not full of artificial ingredients and sweeteners. I like Solgar Whey to Go, Protein Pow sunflower seed or whey protein, Sun Warrior Pea or Pulsin Pea or hemp powders). 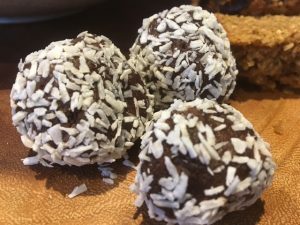 If you have younger children, or you don’t want to use protein powder, – you can make these protein balls with some extra ground almonds or other ground seeds. Mix all the ingredients together in a bowl, until it forms a thick paste. You may need a few drops of extra water. Tip some unsweetened desiccated coconut on a plate, grab some of the paste, roll into a ball then roll in the coconut. Put in the fridge to firm up. These are best stored in the fridge. Note: I don’t advise using protein powder for young children, but from around the age of 6 you can add just a little bit (eg a heaped tablespoon) to protein balls for extra sweetness and protein. You’re only going to give them a small ball anyway -around the size of a large marble. For smaller children, use some extra ground almonds.